If you have a question that’s not answered on this web site, please contact us. We’ll be happy to provide the answer. Individuals or spouses of individuals enrolled in a federally recognized tribe or non-enrolled members.. Call Pete Upton at 308-850-0303. We’re open Monday-Friday from 8:30 am to 4:30 pm. You’ll complete a customer information form, and meet briefly with staff to review your information. If you want help to start a new business, we’ll register you for the next orientation class. If you own a business and want to apply for a loan, a business development specialist will explain Native360’s loan process. What can I use loan proceeds for? You may use loan funds to start a business or expand your business. If your business is located in our Nebraska service area, you may use funds for your business. Yes. Native360 Inc. requires collateral, even if it is in a subordinated position. Borrowers must contribute 10% of the project costs as equity. Can you help me with bank financing? Yes. If you qualify for a bank loan, we can prepare and walk you through the process with one of our banking partners. Will you help me fill out my paperwork? Absolutely. The loan application process begins with an interview with a business development specialist. Call 308-850-0303 for an appointment. If the business development specialist determines that Native360 Inc. staff or its loan committee will likely agree that you are a loan candidate, you will need to be able to provide the documents on our loan checklist. Loan applicants should allow 3 to 6 months to complete the loan application and review process. Do I have to take classes to get a loan? Training is a pre-requisite for most Native360 loan products. Even if you are a seasoned business owner, refresher courses are important to your overall business plan. Are there fees for your training, meetings with a business development specialist, or for submitting a loan application? Yes there is a $69 fee for our business orientation training or Indianpreneurship class. There is a $25 loan application fee. Can I attend the training and classes without applying for a loan? Of course. Just call 308-850-0303 for the latest class schedules. 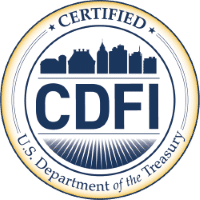 CDFI stands for Community Development Financial Institution. We are an independent, non-profit lender that is certified by the US Treasury CDFI Fund. We focus on assisting individuals who are good candidates to open businesses and pay back loans, but are not having their needs met with traditional bank loan products. We can also partner with banks in offering loan products, especially larger loans. Do you give any grants to small businesses? No. We provide training, technical assistance and a loan fund program to support business development.